On the founding meeting of the RMH Society in Copenhagen in the spring of 2006, one of the participants showed an old ring which he had received along with some RMH items from RMH's great grand son, Ole Odder, grandson of RMH's daughter, Zara, married Bech. He had been given the information that the ring had once belonged to RMH himself. 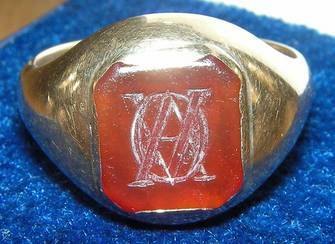 It was obviously a great experience to hold in our hands, RMH's own ring, but there were also some doubts about the origin of the ring, because the engraved letters were clearly an A, V and O. What on earth could be the meaning of these letters? RMH's full name was Hans Rasmus Malling Johan Hansen, so the letters couldn't have anything to do with his name! Or could they? There is an "A" in all of RMH's names - but what about the "V" and "O"? I must admit, that I was one of those, who felt rather sure, that the information about the ring must have been wrong, and that the ring probably must have belonged to Ole Odder, and maybe was a heritage from his family. 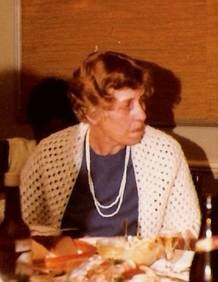 This belief was confirmed when I enlarged a picture of RMH's widow, Anna Steenstrup, who died 7 years later than RMH. She had some rings in a chain around her neck, probably from her late husband, and none of the rings had any resemblance to the ring from Ole Odder. Zarah on a photo from 1974. She was a very coulourful person, also known as "Red-Zarah", and lived until she was 100 years old. She was married twice, first Odder, and then Sprecheler. Photo: private. Here is a closeup of the rings from the picture of Anna. It shows a large engraved gold ring. The letters are not easy to see, but could possibly be RMH put together. This is a closeup of RMH's hands from the famous painting made by Malthe Englestedt. This picture can't give us any help, because RMH is painted with only his wedding ring on his fingers. But if there has been any doubts about the origin of the ring from the Founding meeting, I can now present some facts that confirm with the utmost safety that the ring once really was RMH's personal belonging! Among some recently discovered letters, I also found some envelopes, addressed to RMH's mother, Juliane Hansen, typed on a writing ball. The envelopes were sealed in the oldfashion way, and I was very excited when I made an enlargement of the sealing: And what did I see? 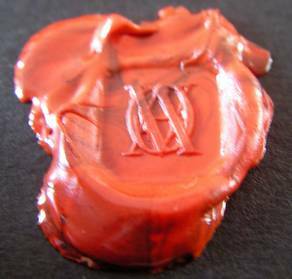 Yes, a totally identical imprint to the one shown to us at the Founding meeting! This establishes as a fact, that the ring once has belonged to the great inventor, Rasmus malling-Hansen! This is the front of the letter, addressed to "Velädle madame Hansen", written on a writing ball. 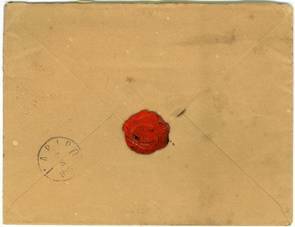 The letter is dated 1. of August and is probably written in 1872. Unfortunately we don't have the actual letter. This is the back side of the letter with the sealing. I was truly astonished when I realized that the sealing was identical to the one I had seen before! We have now cleared up in one of the mysteries concerning Malling-Hansen's old ring. We know for sure that the ring really was his! But one great mystery remains: What does the letters on the ring stand for? We don't know the order in which the letter should stand. Should it be A V O - or V A O - or maybe O A V? We don't know. Could it be a ring that RMH inherited from someone? His father, his stepfather, or someone else who was close to him? 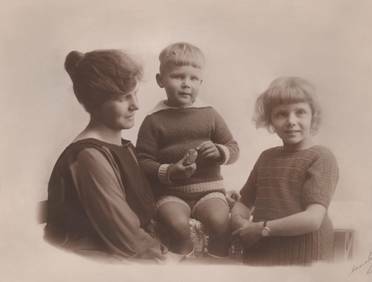 His father's name was Johan Frederik Hansen and his stepfather's Rasmus Malling. So, no, it doesn't seem likely that any of them could have been the owner. Could it be that the letters stands for some latin words, or an old saying? Could it be a membership ring from an organisation, or from an institution he has attended? We, the board of "The International Rasmus Malling-Hansen Society", would truly appriciate every good suggestion from our members or from any other person who could help us to reveale the meaning of the letters on RMH's old ring! So, please, if you have any knowledge that can help us, contact the webmaster, Sverre Avnskog, on s_avnskog@hotmail.com. 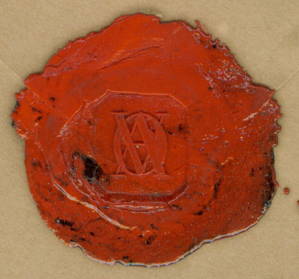 The original sealing on the envelope from 1872. Can you help us to find the solution to the RMH ring mystery? 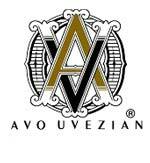 The Avo-cigar label! Looks just like the RMH ring, doesn't it? During the time that has passed by since I wrote about the RMH ring, I have now and then done some research on the internet to hopefully come across some clues that could help us to solve the mystery about the letters on the ring. 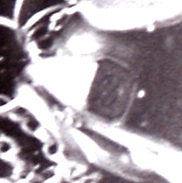 At one point I was almost sure I had found the solution, when I spotted a picture of a label that had an astonishing resemblance to the engraved letters on RMH's ring. So, here we have the solution, I thought, and when I had done some more investigation about this label, I found out that it was a cigar label, and the letters actually show the letters of the first name of the creator of the cigars, Mr. AVO Uvezian. And I must admit that I wasn't at all suprised when I thought that RMH was actually a member of a sort of cigar-club or something like that, because we know from his son-in-law, Fritz Bech, that he very often enjoyed a good cigar, pipe or cigarette! But no, further investigation about Mr. Avo, revealed that his cigar label didn't at all exist in Malling-Hansen's lifetime - he wasn't born until 1923! So much for RMH's membership in a cigar-club! 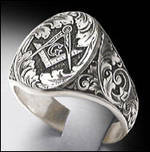 A typical freemason ring. Can it be that the letters on RMH's ring have the same meaning as these symbols? 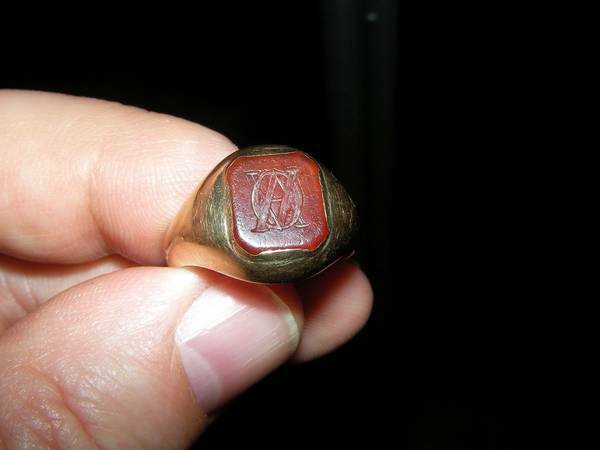 Several people have suggested that the ring must have something to do with RMH beeing a freemason. RMH was a memebr of the lodge called "Frederik and Zorobabel to the good Hope" and reached the ninth grade. 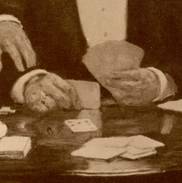 As a matter of fact, to attend a meeting in his lodge was the last thing RMH did in his life on this planet - he died on his way home from a meeting in his lodge a late night in September 1890. I have tried to find some freemason rings on the internet, and yes, as the little picture shows, there is absolutely some likeness between this ring an that of RMH. But then again, they are not that alike - and I don't at all feel convinced that this is really the connection. And then there is this fact that RMH didn't become a freemason before 1877, and the sealing of the envelope that we know of is from 1872, so... no, I don't think this is the right place to search for the answer to our riddle. Not long ago the man who first bought the RMH ring from Ole Odder, gave us the information that the letters on the ring should be the first letters in three latin words. In English: Love conquers everything! Can this be the solution? Is it the romantic nature of Malling-Hansen that made him get this ring made, as a sign of his great belief in love?! To be honest, it wouldn't surprise me at all if this is the solution to our ring mystery. 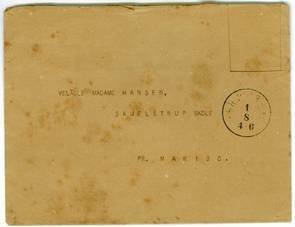 The letters that Malling-Hansen wrote during his lifetime showes a man with true affection and love to his wife and his children - he very often expressed his great love for his friends, and as a priest he focused on the deep love of God and Jesus to the poor human kind! So I must say: Yes, this gives great meaning - at least to me! But if you should have other good ideas, please don't hesitate to contact us! !